Happy new week, my friends! How wonderful it is to start this brand new week with you! May all of us have a Blessed and healthy week, filled with good vibes. 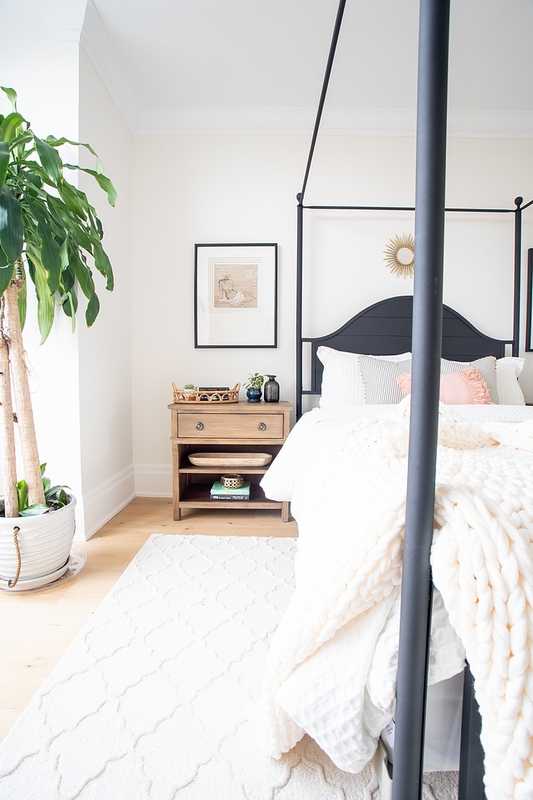 Talking about good vibes, this “Beautiful Homes of Instagram” today is all about that! 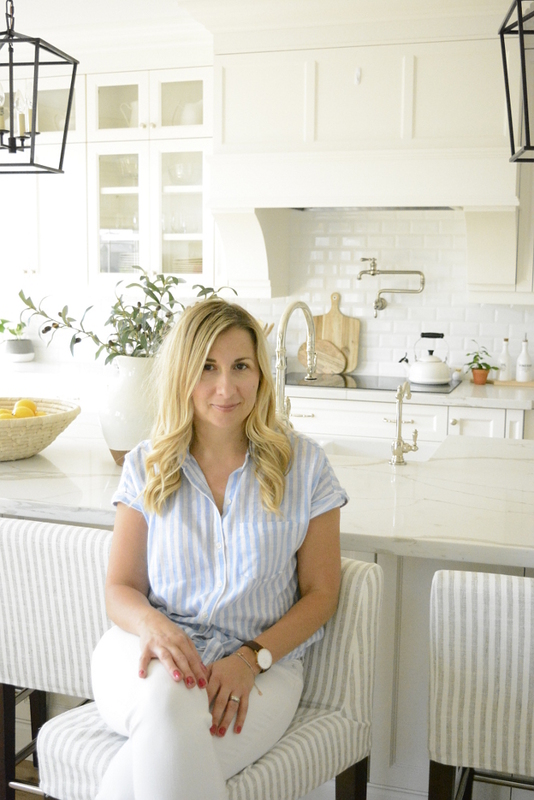 Agata, from @TassonInteriors, has a home that feels heavenly. 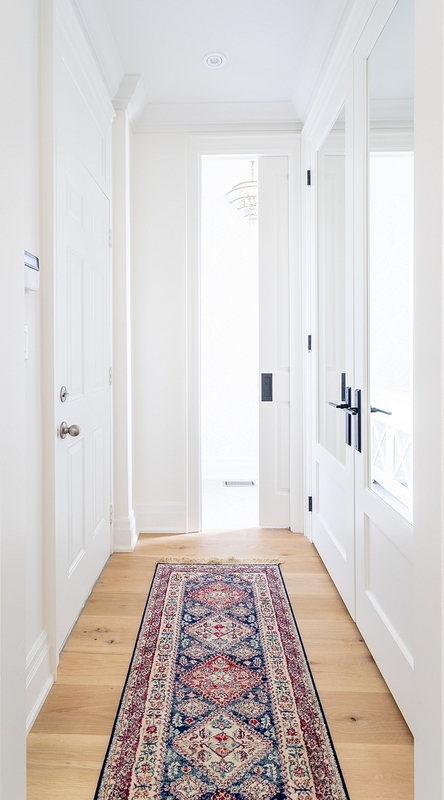 Its neutral color palette combined with classic millwork exudes a timeless elegance that embraces you the moment you step inside. Having Agata on the blog today is truly a great honor. 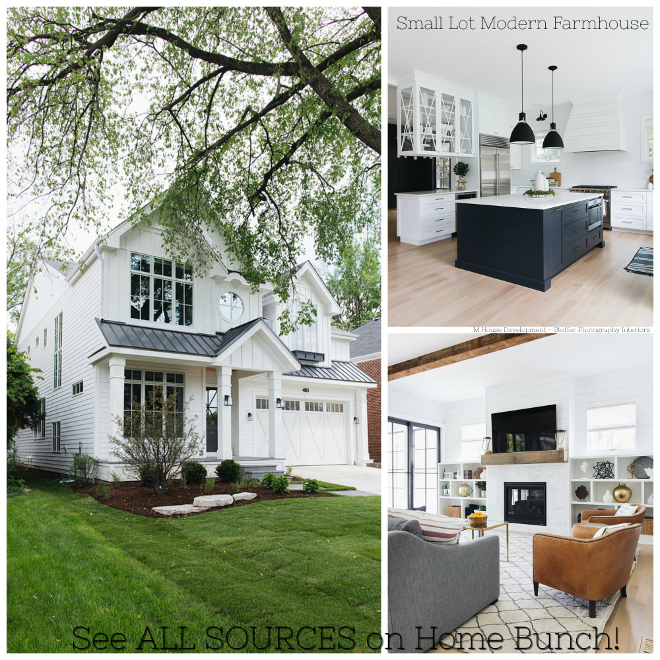 She worked really hard on collecting all sources for this feature and even hired a photographer to share her home with you. Please make sure to follow her on Instagram and feel free to pin her beautiful home! 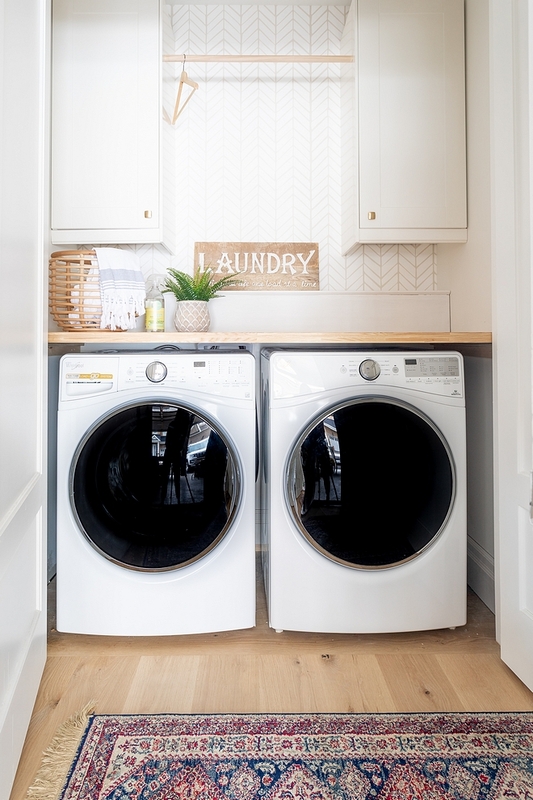 This talented homeowner deserves all the love we can give! “Hi! My name is Agata from @TassonInteriors. 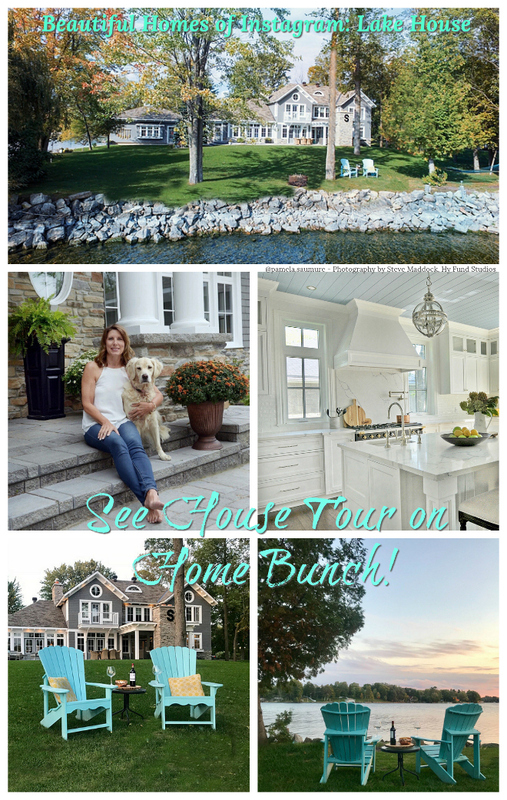 I’m so excited and grateful to be featured by Luciane on Home Bunch! 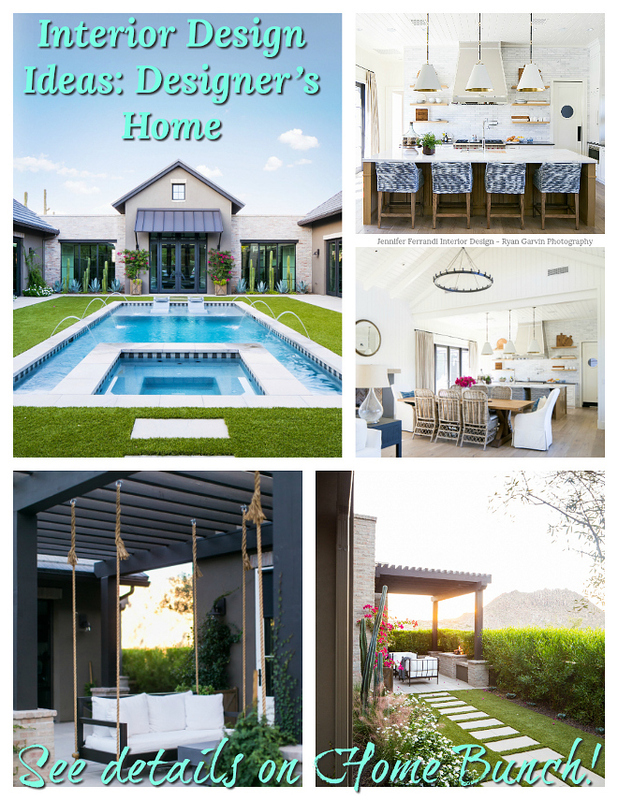 I’ve found so much inspiration here and it feels surreal to be featured among so many talented designers and homeowners. I started my career as a criminal prosecutor ten years ago. When our daughter was born I took a break from law to enjoy these precious young years with her. During that time my husband and I started our third home renovation. Earlier this year I started an Instagram account to share our renovation, and my love for design. With the encouragement of family and friends I am now in the process of pursuing my longstanding passion for interior design and decorating as a career. How inviting! 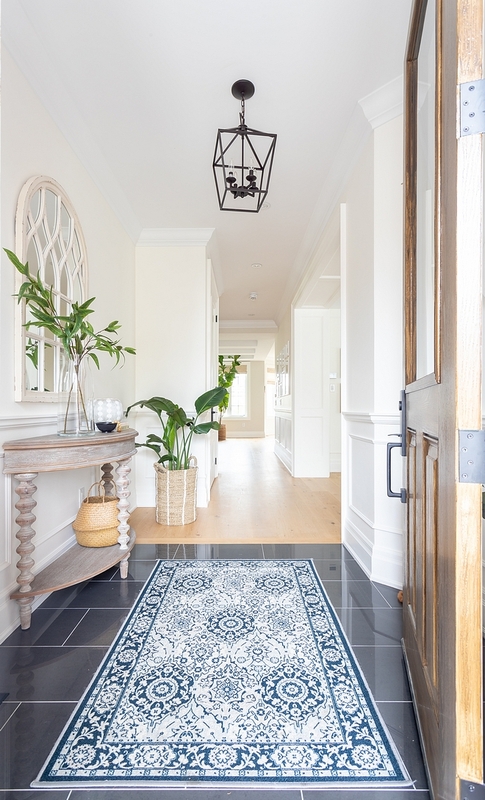 Great design and beauty embraces you the moment you open the front door. Notice the classic wainscoting. Rug – HomeSense (HomeGoods in USA) – similar here & here (in Blue-grey). 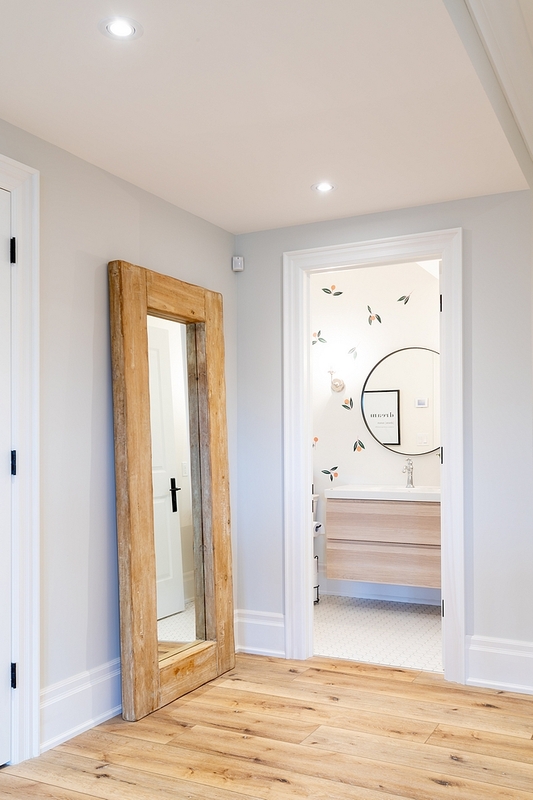 This gorgeous arch window mirror is from Pier One. 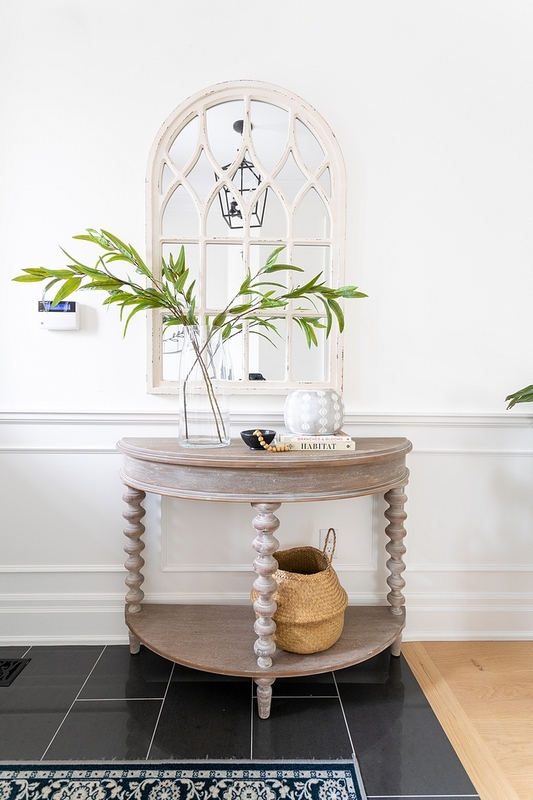 Console Table – Wayfair – similar here & here. Basket – Ikea – similar here. 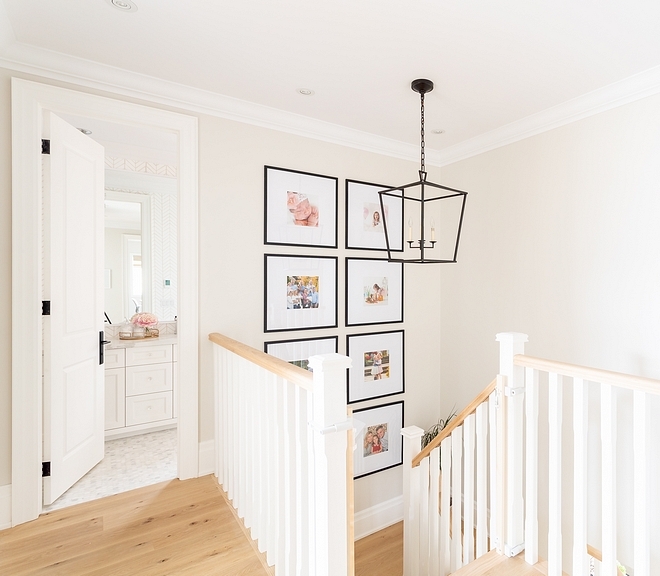 Walls and wainscoting are painted in Simply White by Benjamin Moore. I love having a separate dining room but we didn’t want anything too formal or fancy. We love to host family and friends, but our dining room isn’t just for special occasions. We eat dinner in our dining room every evening. It’s so important to me for our family to connect around the table at the end of the day. Table – similar at RH, here, here & here. 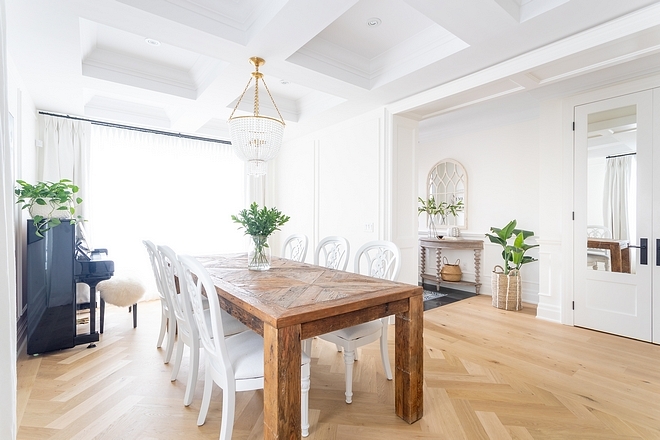 These herringbone floors were a last minute decision which turned out to be our favourite feature of this room. We also added some millwork to give the white walls some interest. Chandelier: Visual Comfort Co. hand -rubbed antique bras with clear glass. Picture Frame Wainscoting: We added picture frame wainscoting to the dining room and the master bedroom. 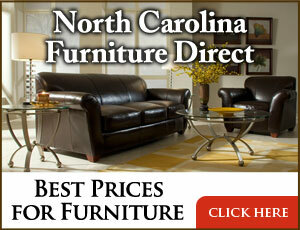 It gives both rooms a more elegant and custom feel. 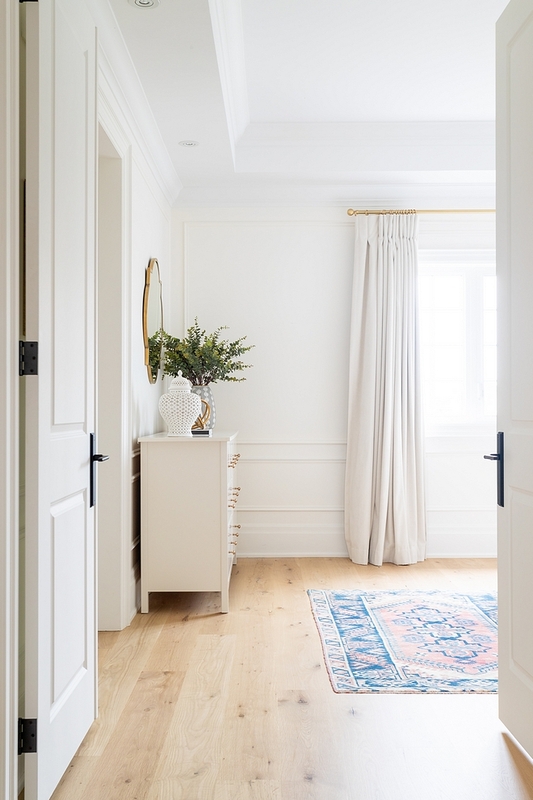 Drapes – custom made by family member (white linen fabric). Chairs – Sears Canada (years ago) recently re-upholstered with Tonic Living fabric (Weston, Salt) painted by Paint it Like New – similar here. 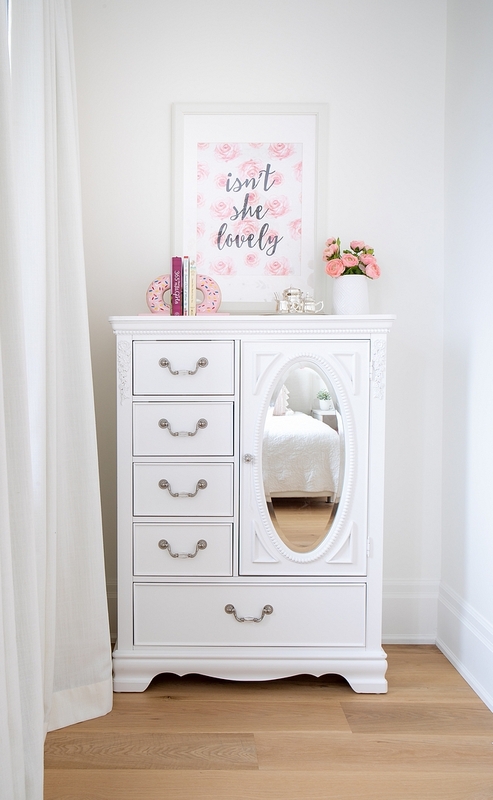 Art Work – HomeSense similar available through McGee & Co. 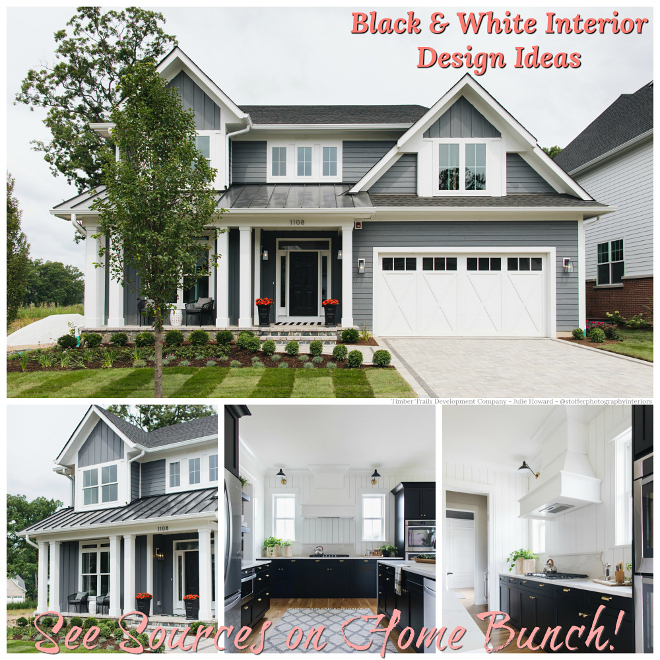 Paint color is Simply White BM. A butler’s pantry is located between the dining room and kitchen. 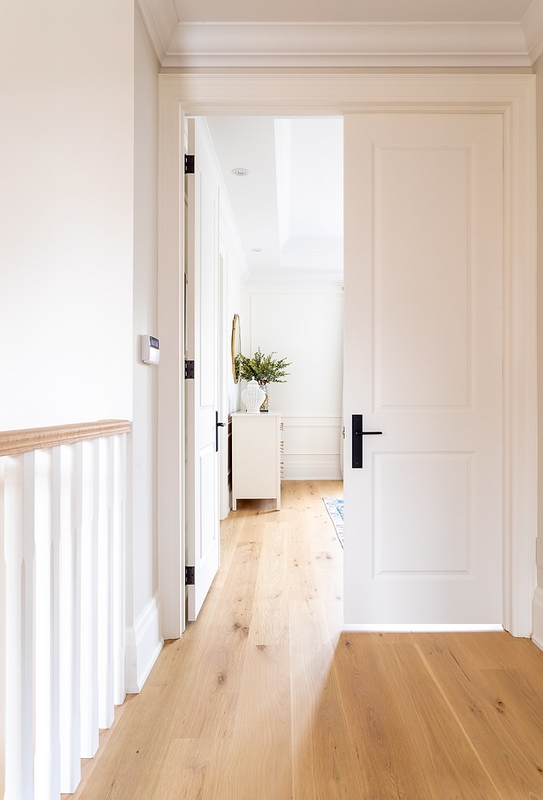 The wide plank European white oak floors are by far my favourite feature of this house. They add so much character and warmth to our home. They also give it the light and airy feel that I was after. 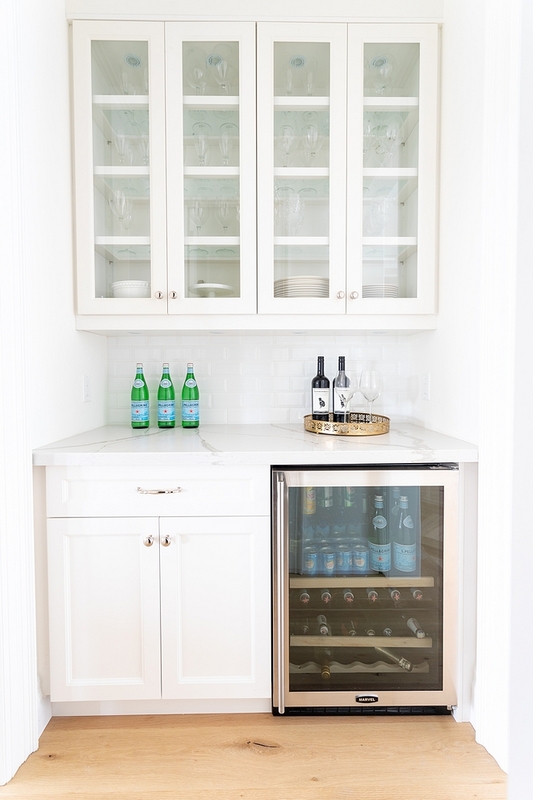 Glass doors give an airy feel to the butler’s pantry cabinetry. This is our favourite space in our home. 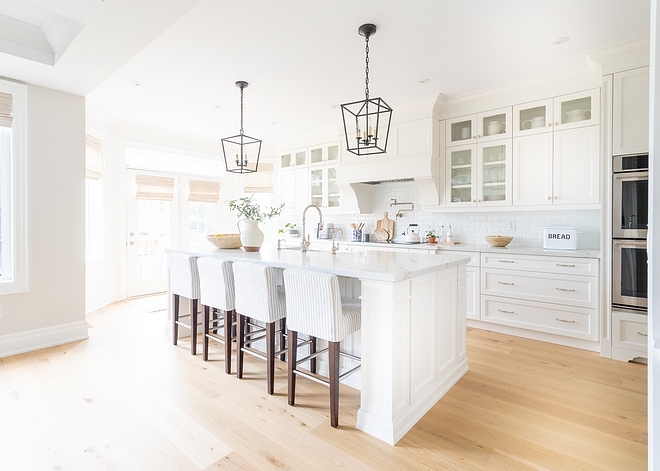 I love the open floor plan kitchen and family room. It’s where we spend most of our time preparing meals, playing, reading and enjoying our family time. The back of our home is southwest facing so we enjoy a lot of natural light here. 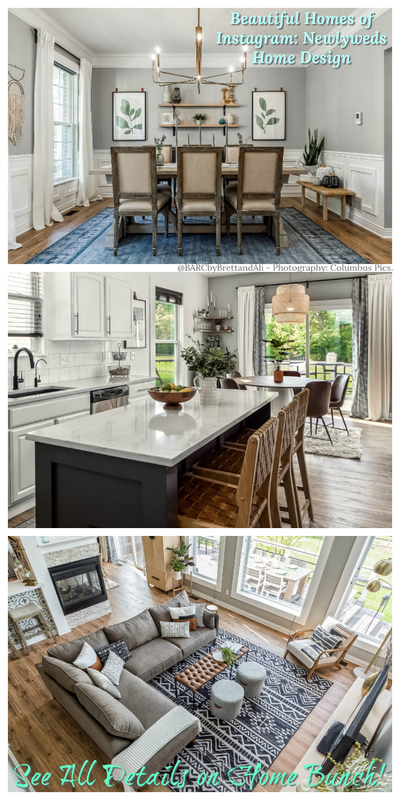 We eliminated the breakfast area and designed this custom kitchen opting for a large 9 x 4.5 foot island instead of a breakfast table. I wanted the kitchen to feel modern and fresh yet timeless. The panelled fridge was a splurge but I absolutely love it. 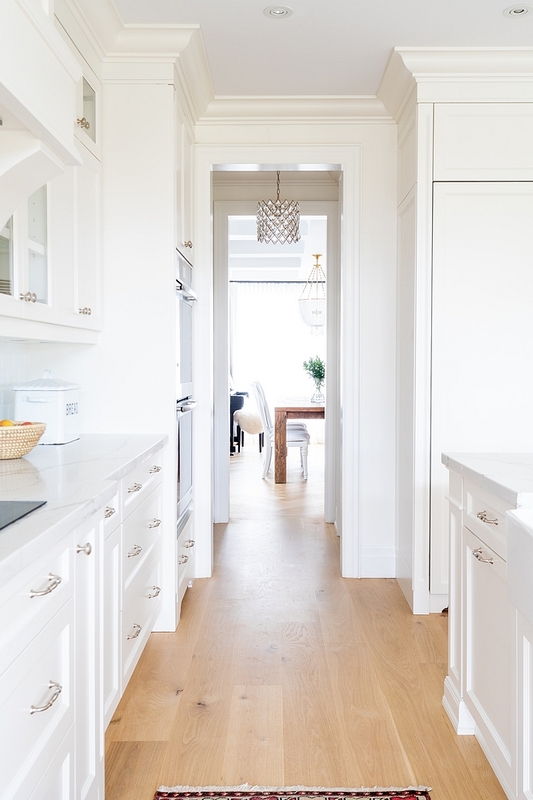 Cabinet Colour – Simply White by Benjamin Moore. 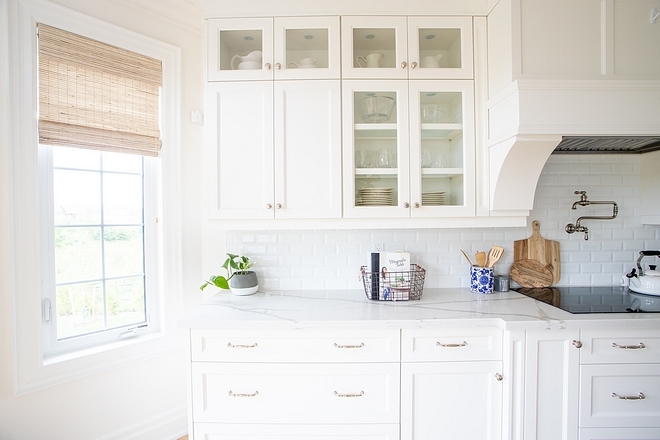 For the backsplash I opted for a very classic white bevelled 3 x 6 subway tile. 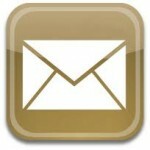 I didn’t want anything too busy or trendy. 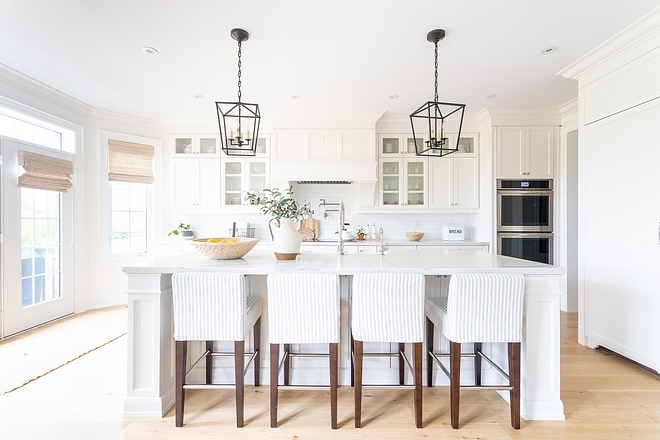 I love how the backsplash compliments the quartz counters without competing with them. 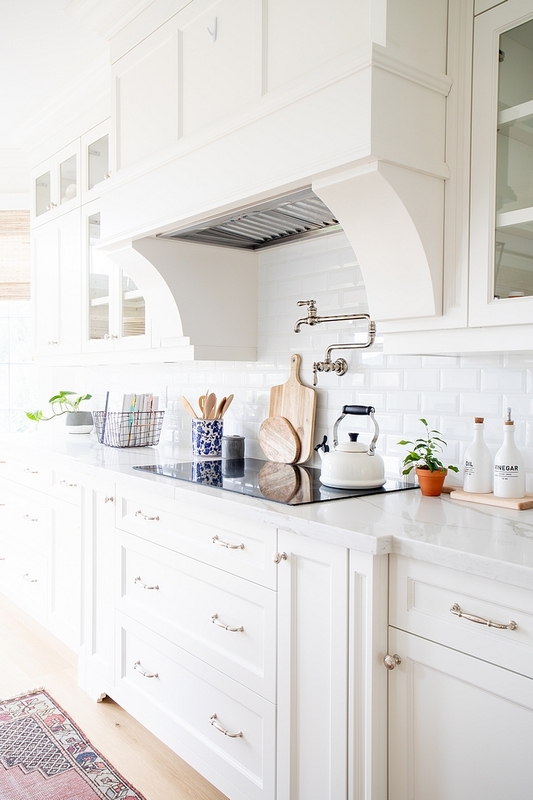 Backsplash – 3×6 white beveled subway tile – similar here & here (crackled tile). The Roman shades are Hunter Douglas, Provenance Collection. The refrigerator appliance pulls are Jeffrey Alexander – Tiffany Collection. 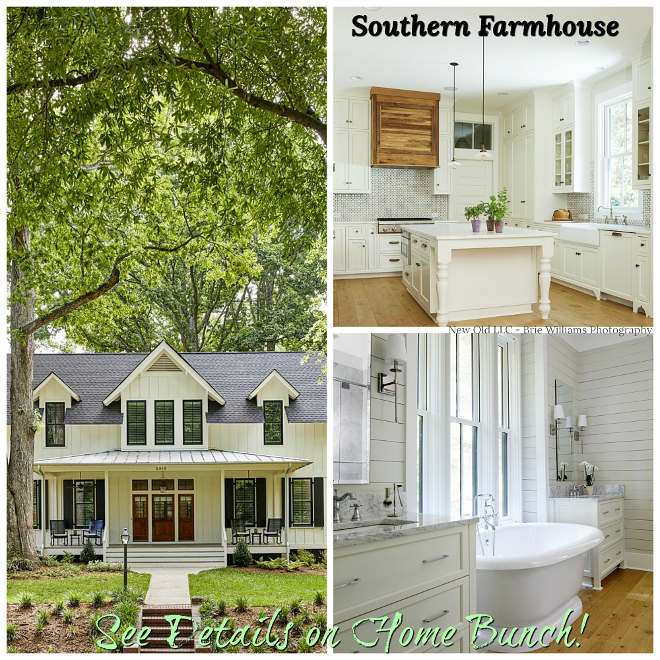 Farmhouse Sink – Franke MHK720-35WH Manor House, White. 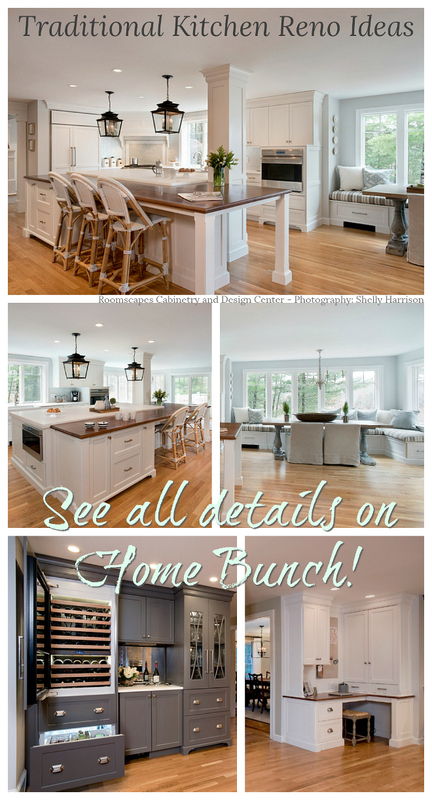 Cabinet Hardware: Knobs, Pulls & Dishwasher Pulls in Polished nickel. 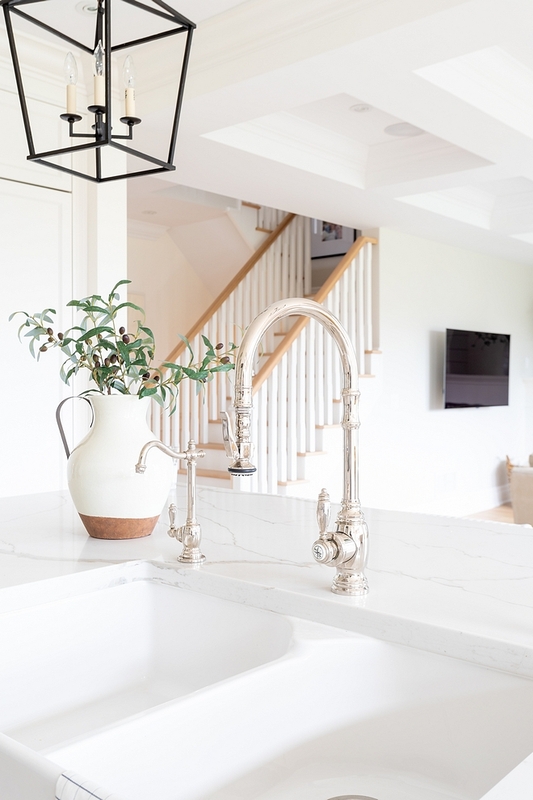 I like the fact that the mix of metal in this kitchen exists but it’s limited to two finishes; polished nickel and aged iron. Flooring: 7.5 inch European white Oak made by Purparket unstained (sanded on site). Finished with a clear coat made by Loba – No stain used – similar here. Vase on island – Pier1. Woven Bowl on island – Ten Thousand Villages – Other Beautiful Natural Bowls: here, here, here, here & here. Pendants – Visual Comfort Darlana Pendant – small in Aged Iron. 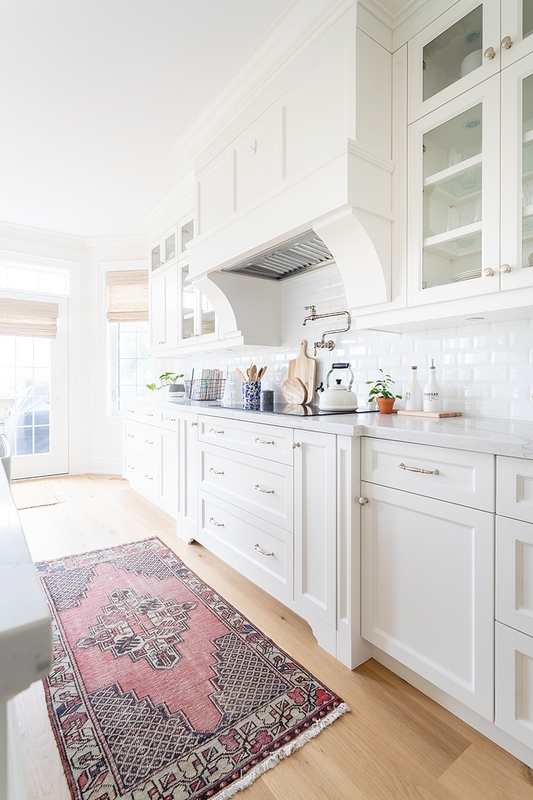 Kitchen runner is vintage – good sources for vintage runner: here, here & here – similar here. I searched and searched for the perfect counter stools but ultimately I decided to stick with the ones that I already had. Instead, with the help of Anne from Oakville Slipcovers I had slipcovers made from some beautiful striped fabric from Tonic Living. I’m so happy with how they turned out! Barstools – Homesense find years ago but I recently added these slipcovers Slipcover fabric is Tonic Living. 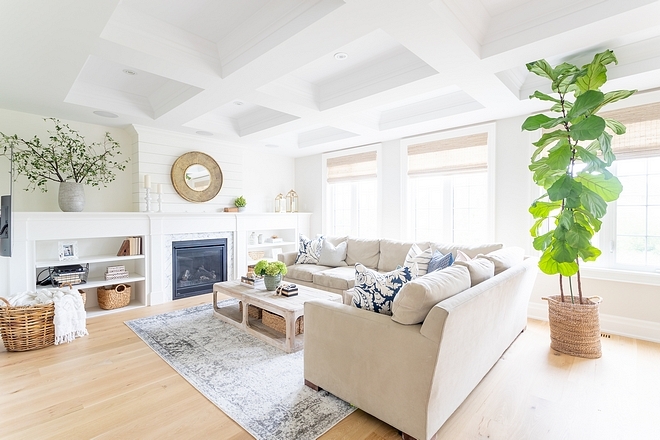 Custom made by Anne at Oakville Slipcovers – similar here – (Select Fabric: Perennials® Performance Shirting Stripe – Pewter). I love the generous size of this room. We opted for a sectional sofa to maximize seating. 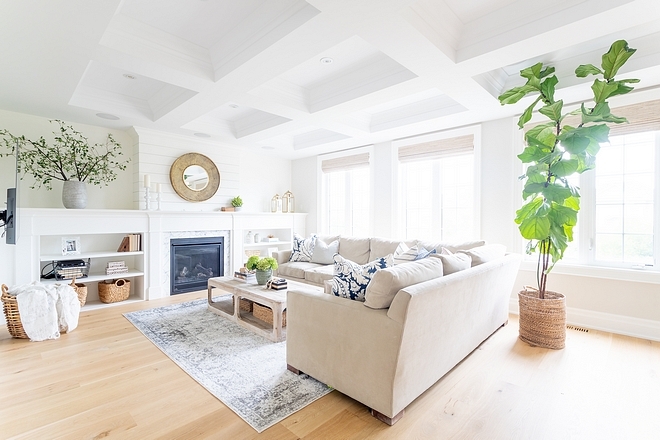 We added a coffered ceiling to add some character and interest to this room, as well as to add some definition to the space. My husband built the shiplap wall above the fireplace. 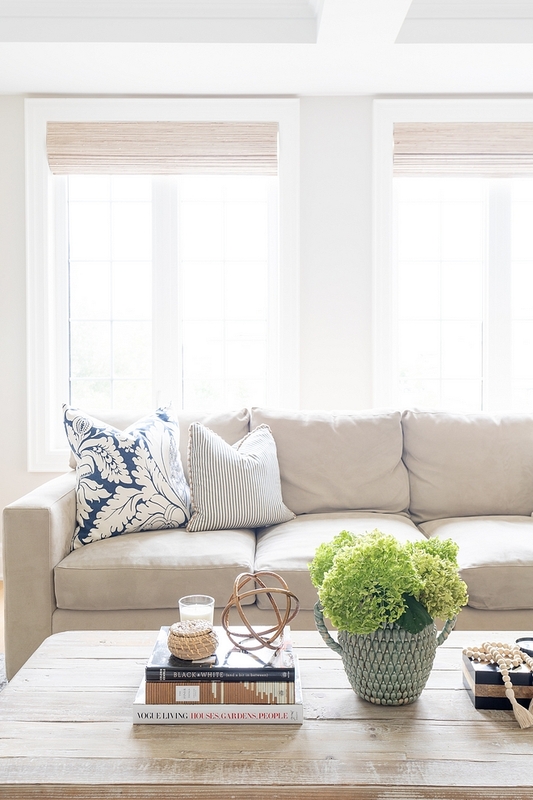 Sectional Couch – custom from Crate & Barrel in colour Pumice. 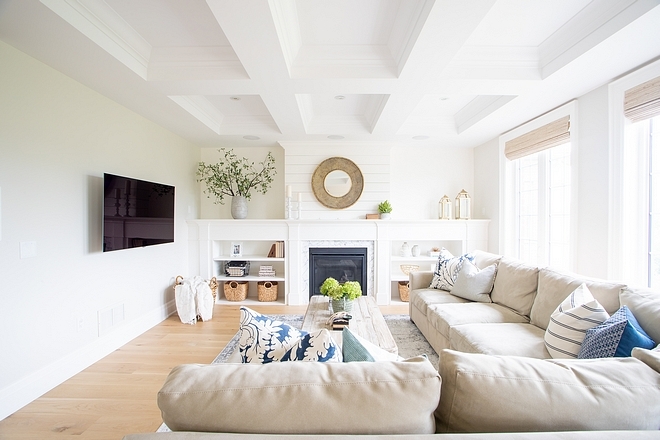 This is a good way to place pillows on a sectional sofa. Pillows: The striped one in the corner is from H&M home (similar here). 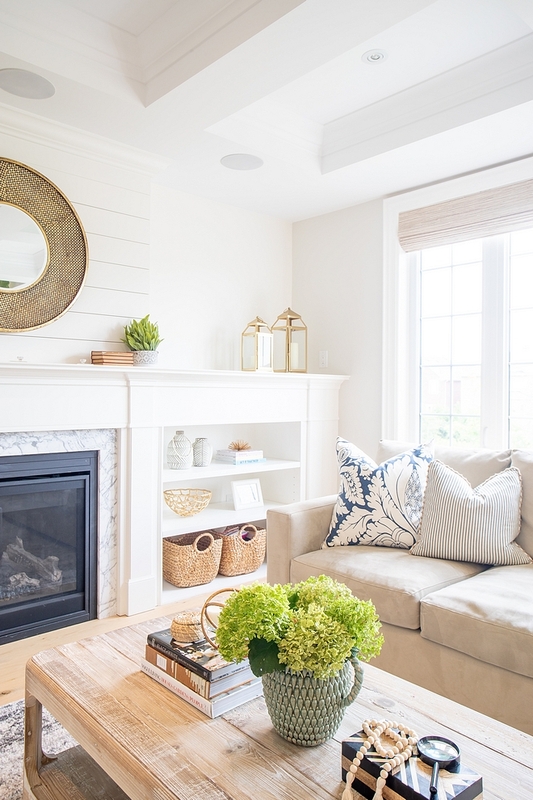 The blue one in the corner is Ikea (similar here) and the striped one closest to the fireplace is the sameness one that is from Tonic Living (similar here). 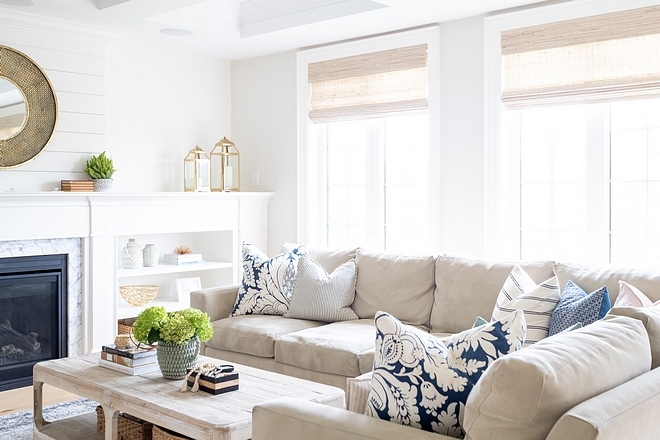 The blue and white 25 inch pillows were also Pottery Barn and no longer available (similar here). Small Vases in built in: here. Vase on Mantle – Structure – similar here. 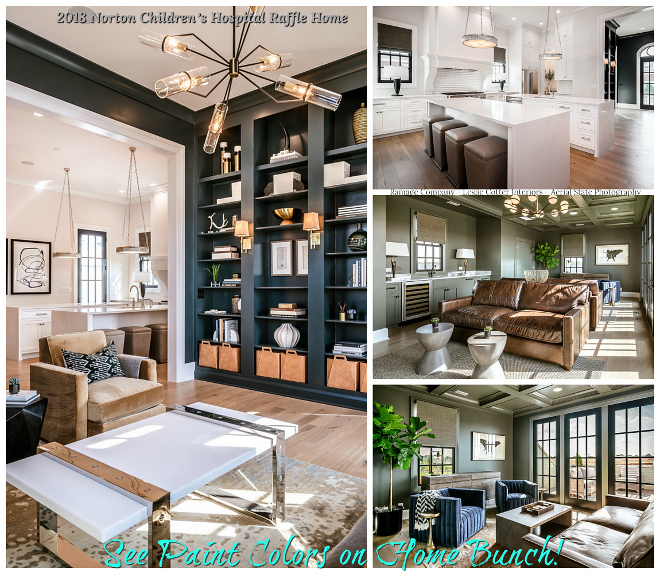 Family Room – Classic Gray by Benjamin Moore. 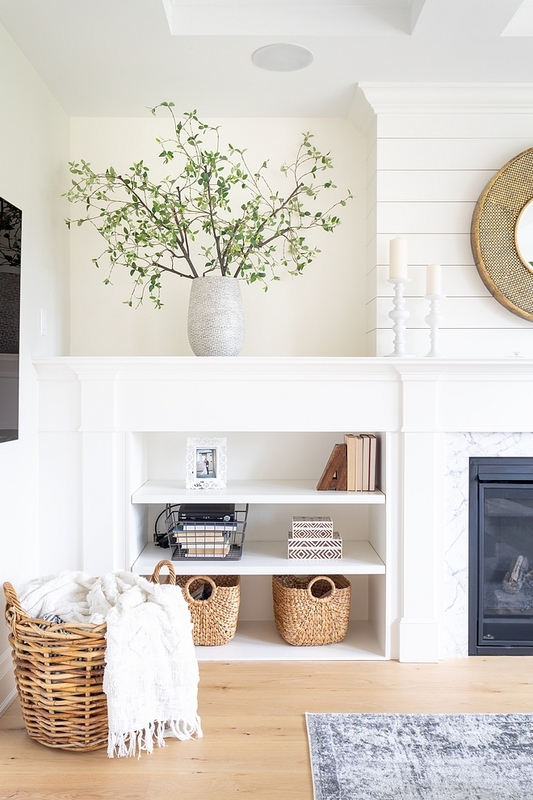 We originally planned to hang the TV above the fireplace but we ended up mounting it on the adjacent wall so that the shiplap would remain the feature. 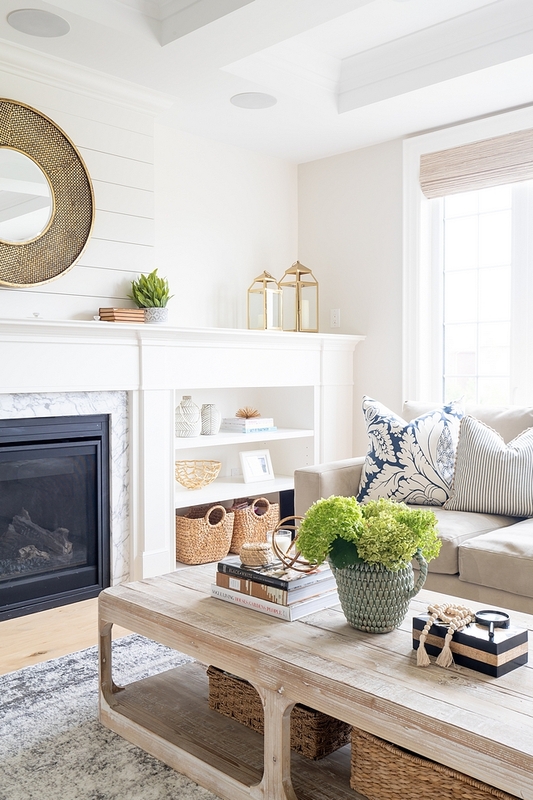 Trim, fireplace and built-ins are Benjamin Moore Simply White. The large basket is from Pottery Barn. Woven Roman Shades – Hunter Douglas, Provenance Collection, colour Trellis. The powder room was originally located between the kitchen and the dining room. 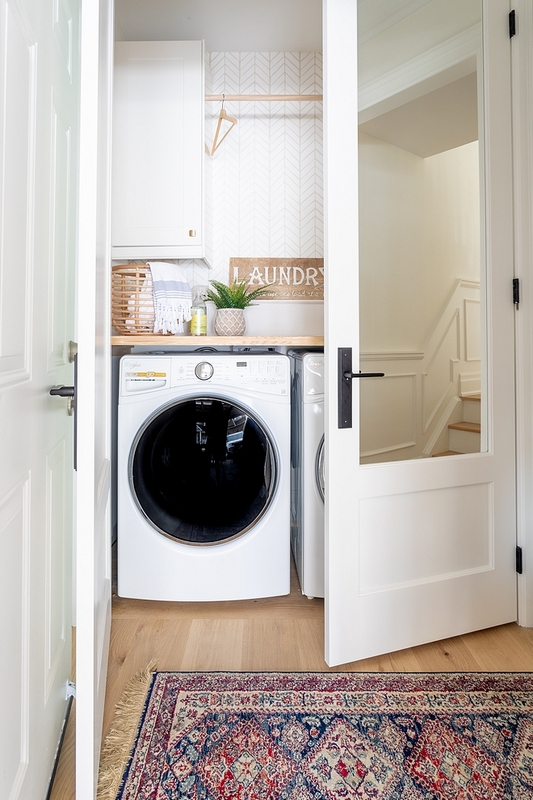 We relocated the powder room into the sunken laundry room. 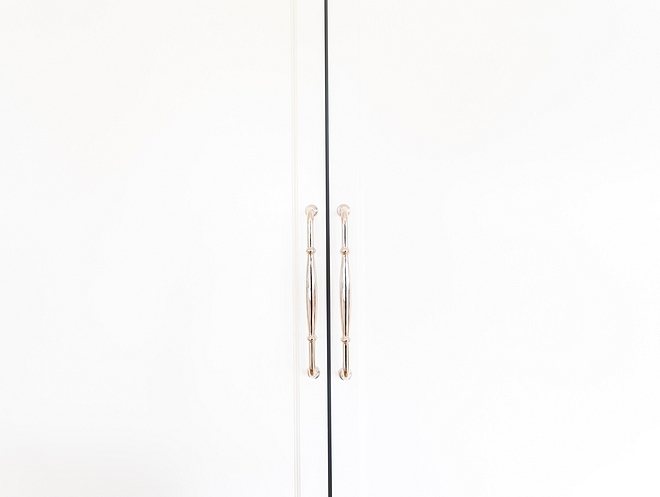 The original powder room was transformed into a walk-in pantry across from the butler’s pantry. I love that the powder room is now in a more discrete spot. 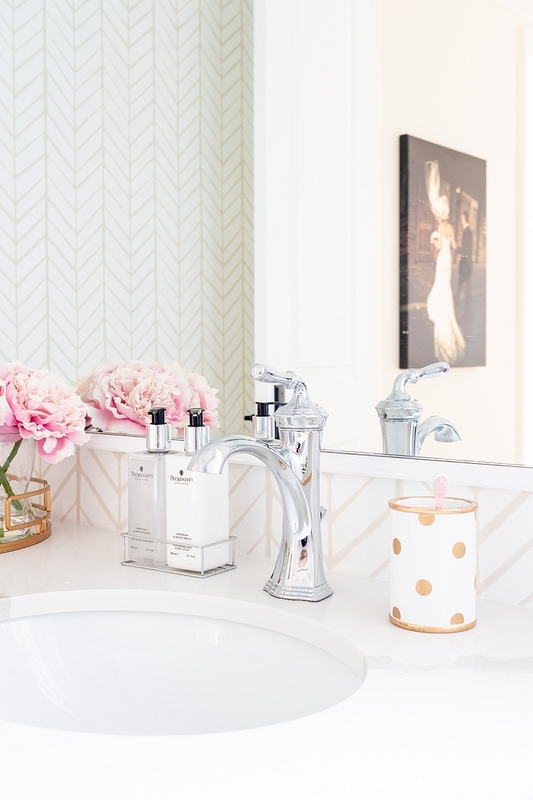 I was really inspired by Luciane’s first Beautiful Homes of Instagram Home Bunch feature @JSHomeDesign’s powder room. 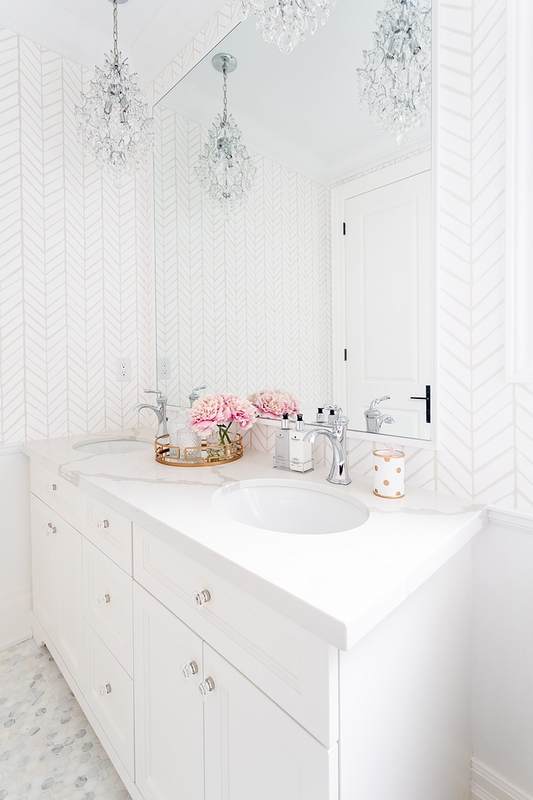 That’s where I found this beautiful Crown wallpaper and this honed marble herringbone tile. 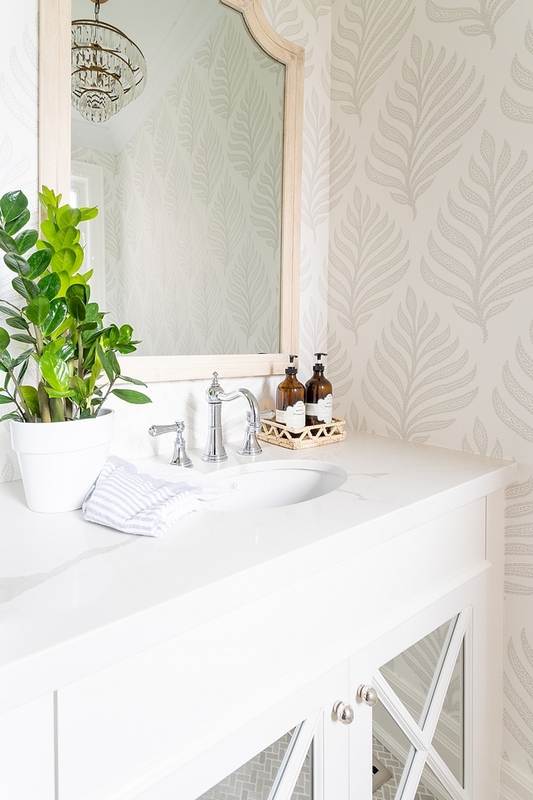 I designed this custom mirrored vanity and paired it with a durable quartz counter. Mirror – Homesense – similar here, here, here & here. Wallpaper – Crown – Other beautiful wallpapers: here. 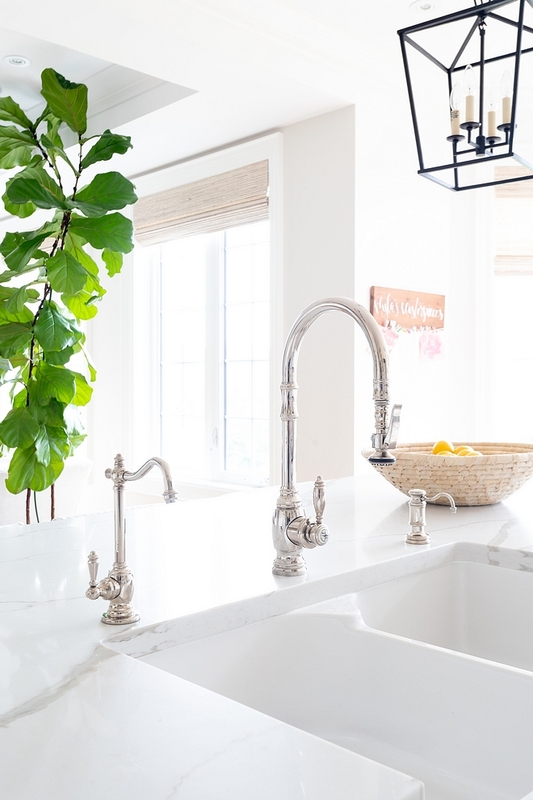 Faucet – Perrin & Rowe. 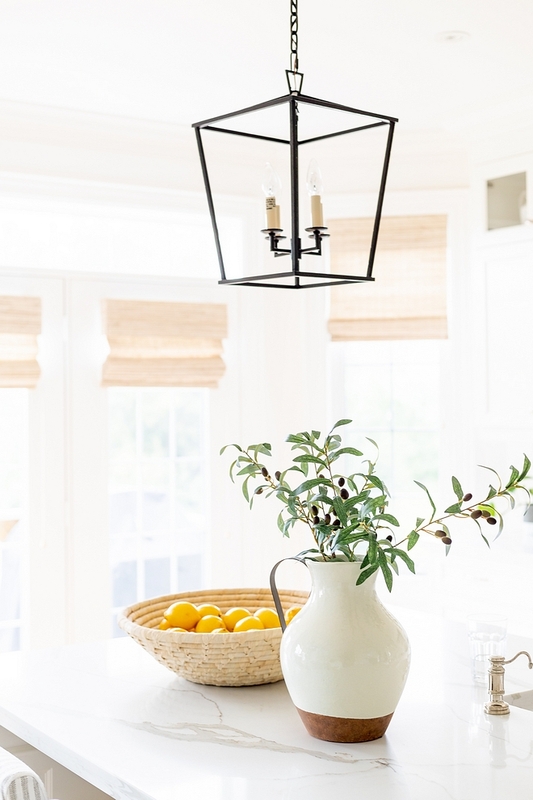 Chandelier – Pottery Barn Kids. 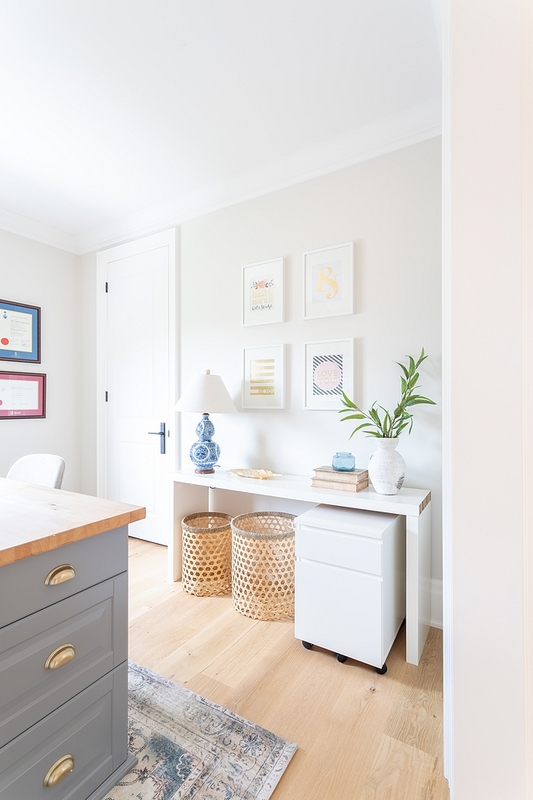 Another favourite space is our home office. This space is also our craft room, wrapping station and future homework station. I love that my husband and I can use it at the same time. 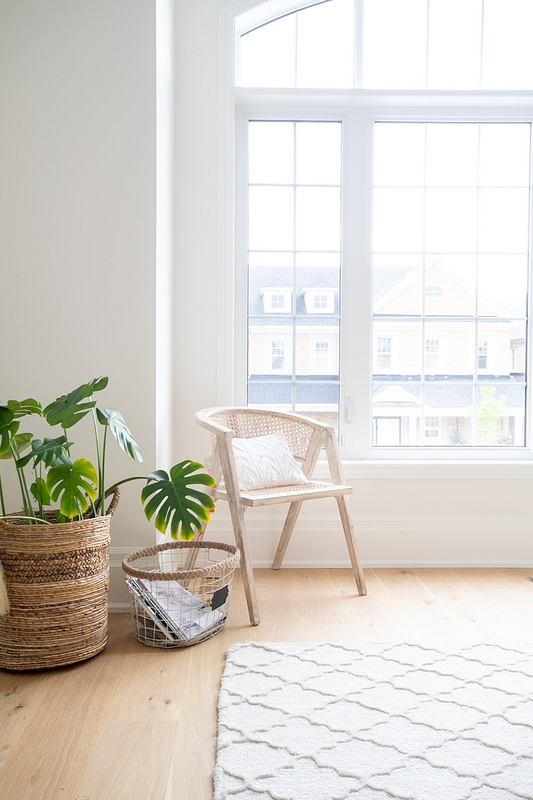 It’s a bright, airy and cheerful space that I look forward to spending time in. Pendant – Serena & Lily Headlands Pendant. 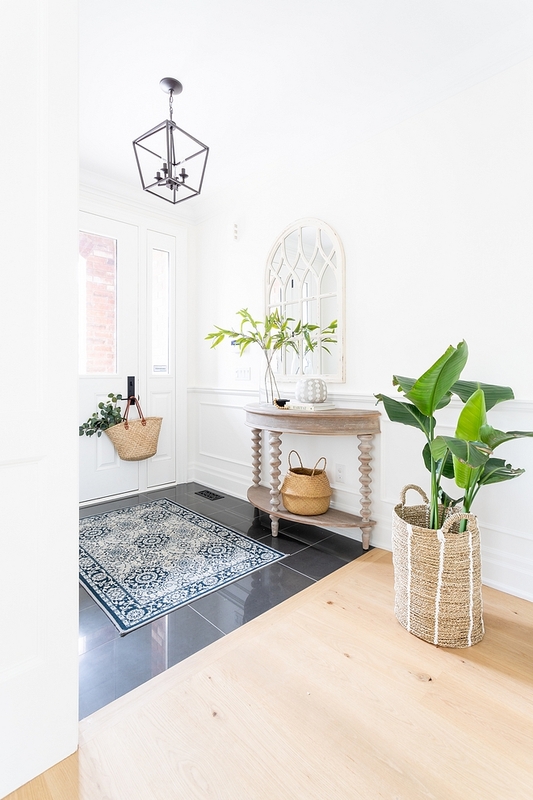 Rug – Homesense – similar here & here. Vase on top shelf: here. Bookcase – CB2 Stairway White 96” wall mounted bookcase. I love the simplicity of this staircase. Notice the square stair spindles and balusters with White Oak railings and threads. 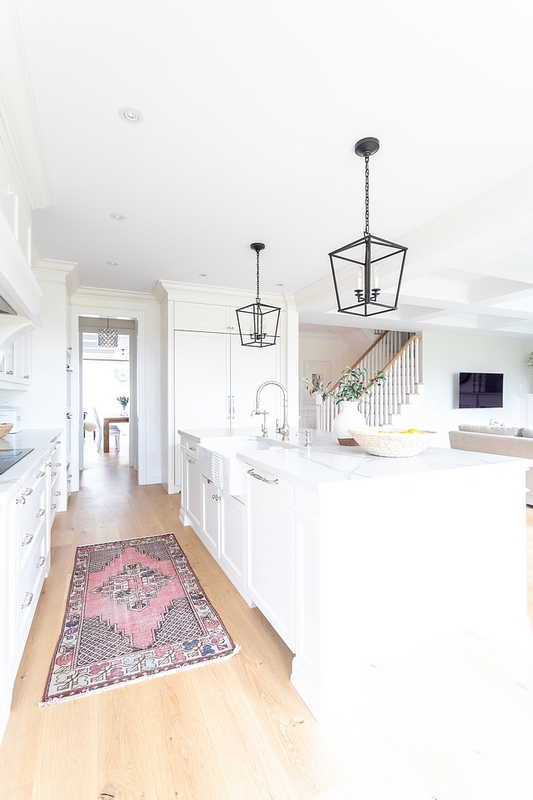 Paint color is Benjamin Moore Simply White. 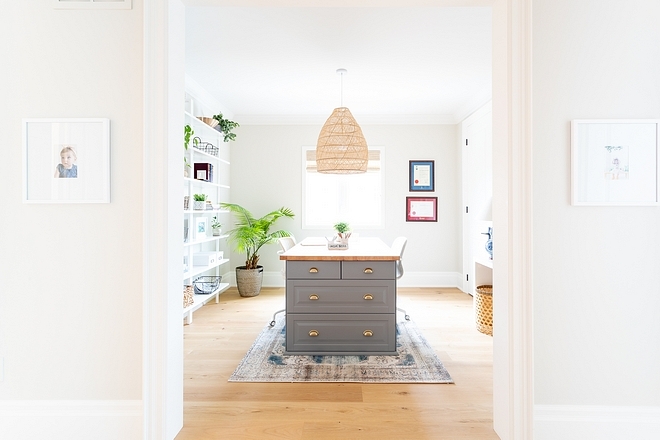 Classic Gray OC-23 by Benjamin Moore. I wanted something different for our guest room and I opted for this black poster bed which really makes a statement. This room is still a work in progress. We are waiting for some drapery and one of the lamps (broke in transit from the US). We also plan to add some millwork on the wall behind the bed. 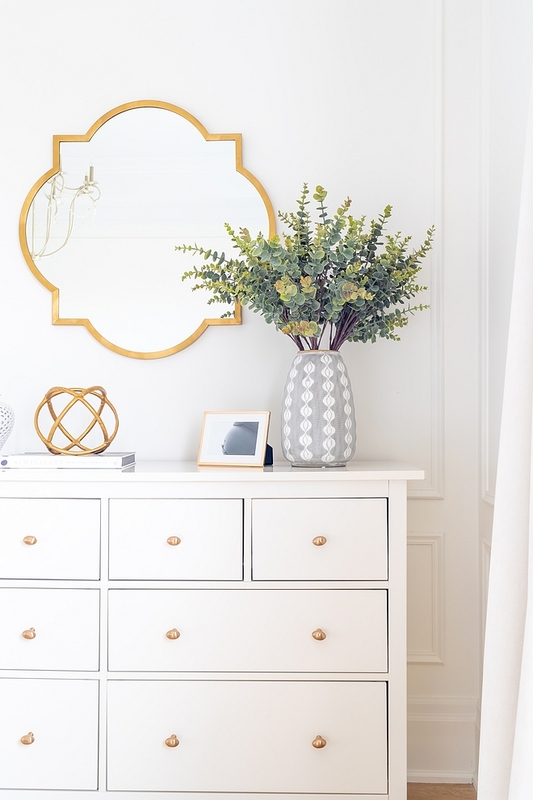 Mirror – Homesense Canada – similar style: here & here. Striped Pillows HomeSense Canada – similar here. Blush Fringe Pillow: Peri Home – discontinued – similar here . 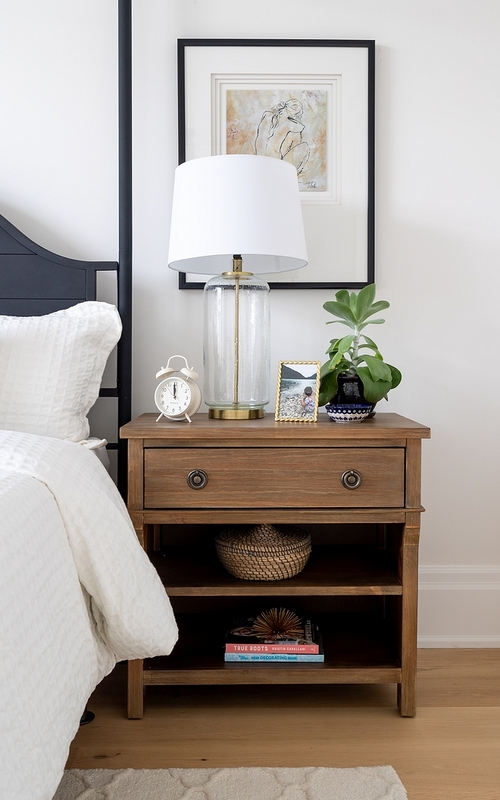 Nightstands: Wayfair Grimaud 1 Drawer Nightstand. by Lark Manor – discontinued. Lamps – Target Bubble Glass with Brass Detail Large. Lamp Shade – Target Drum Linen Lamp Shade White Large. Chunky Knit Throw – Overstock. 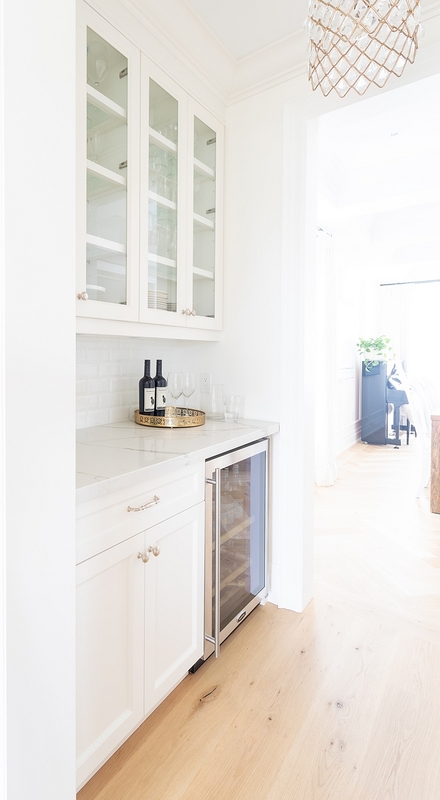 Wall Colour: White Dove by Benjamin Moore. My daughter’s room was my favourite room to decorate. 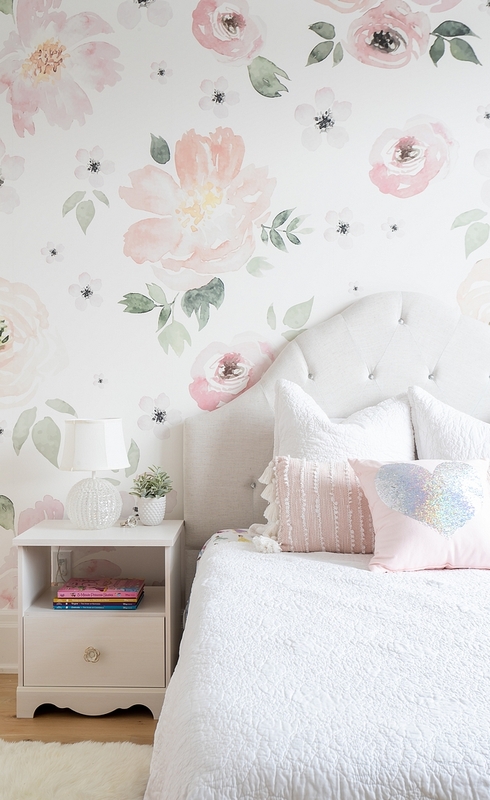 I always dreamed of having a daughter so I was thrilled to decorate with soft pinks and florals. This mural by Anewal l was love at first sight and luckily my daughter loves it too. Wallpaper Mural by Anewall, Jolie Mural – Other Beautiful Floral Wallpapers: here & here. 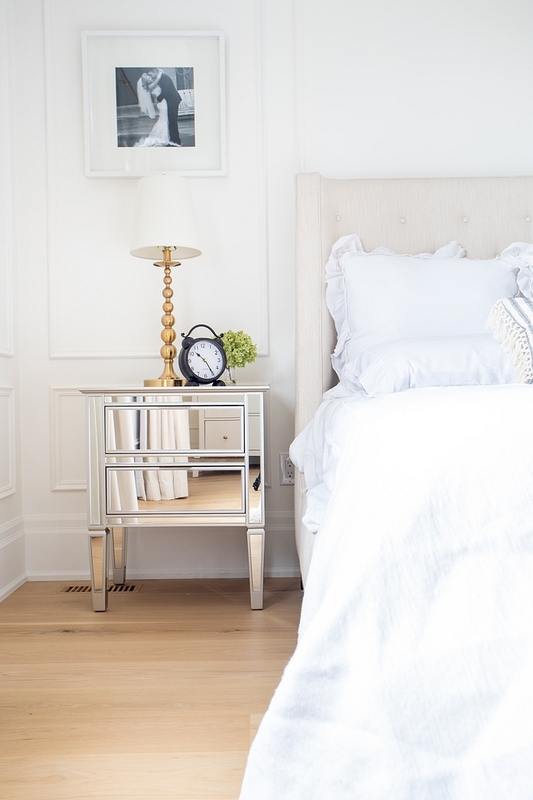 Headboard – Homesense – similar here. 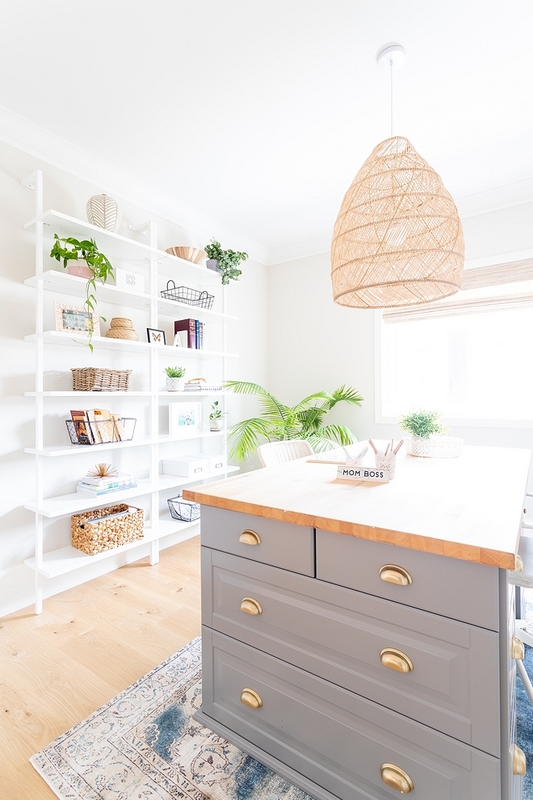 Book Shelves – Ikea – similar here. 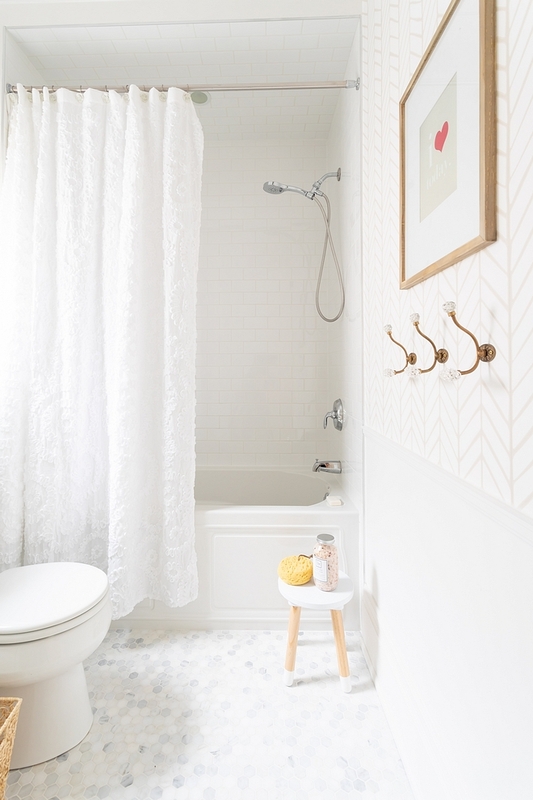 Bathroom Renovation: The only thing we really kept in here was the tub. We added a custom double vanity sink and custom mirror. My favourite part of the bathroom is this gorgeous Serena and Lily wallpaper. 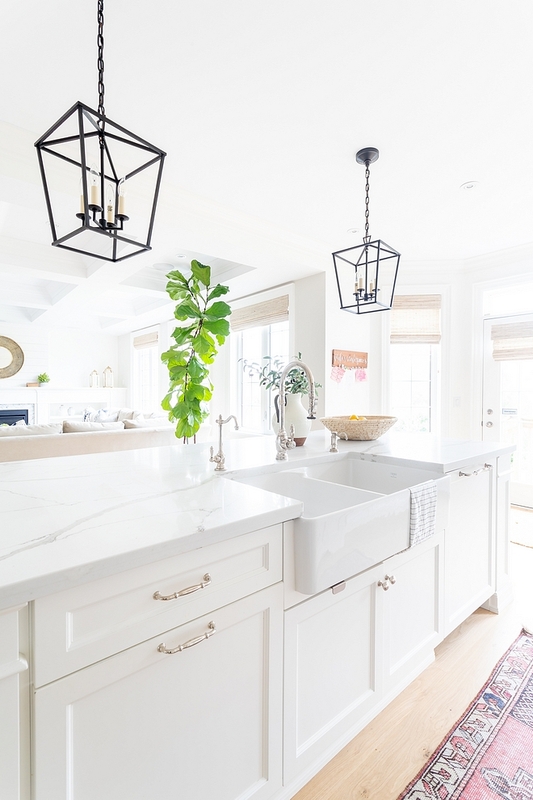 The chandeliers over the sinks add some glam to this space! 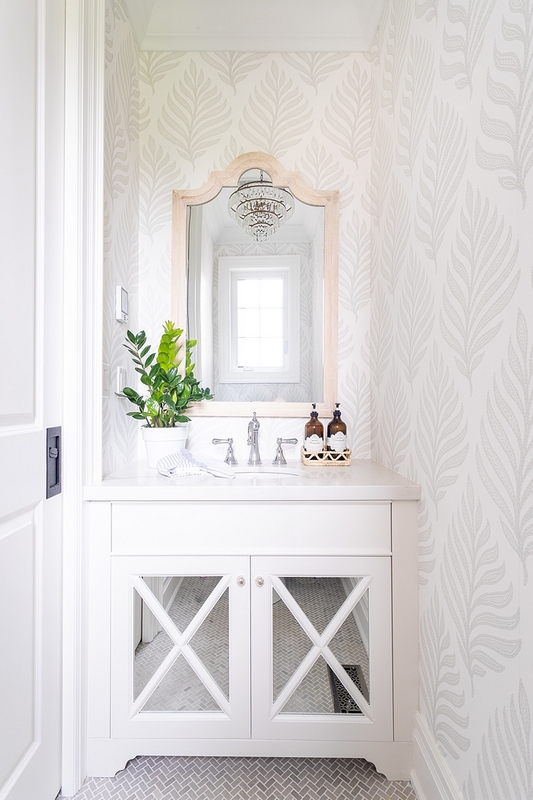 Wallpaper – Serena & Lily Feather Wallpaper in Bone. Chandeliers – Home Depot Tiffany Ellaisse 3 Light Chrome Crystal Chandelier. 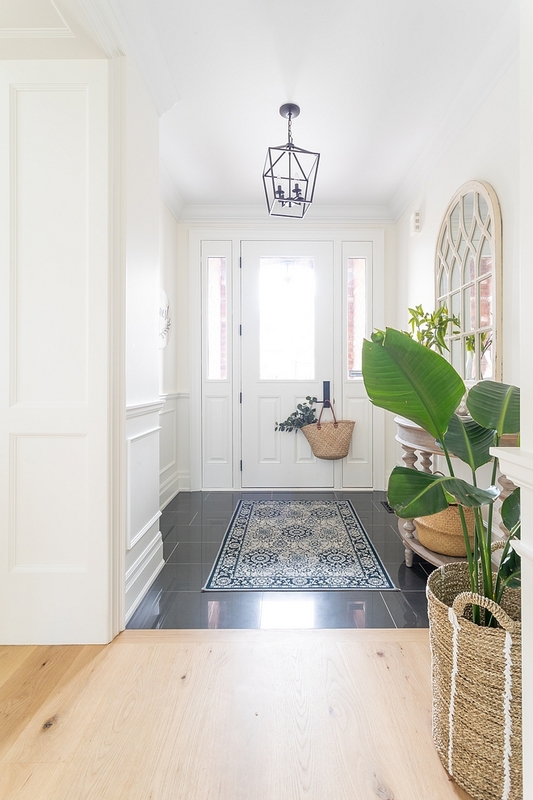 Wainscoting is painted in Benjamin Moore Chantilly Lace. I used a classic marble hexagon mosaic tile paired with a 3×6 subway tile in the shower. Floor tile – Home Depot 1 inch hexagon marble. 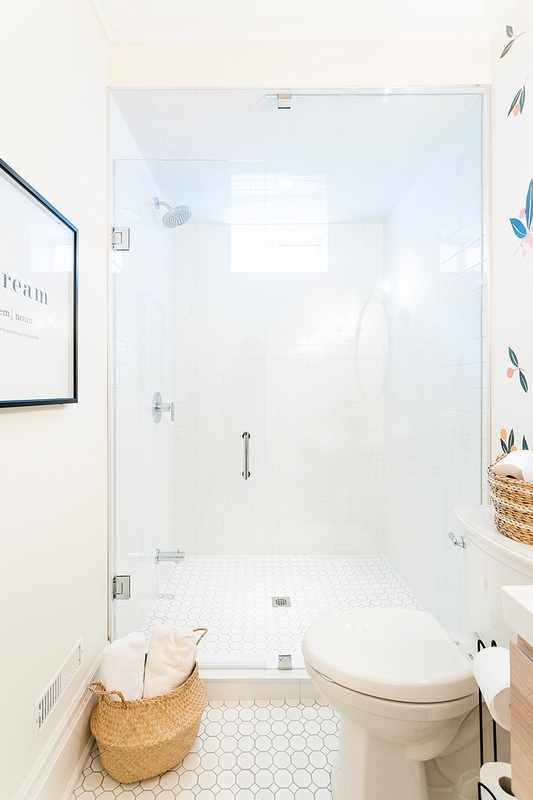 Shower Tile – 3×6 white subway tile. Hooks – Anthropologie Glass Etoile Hooks. Double doors open to a gorgeously designed master bedroom. Drapery – Q Design – velvet in colour Parchment – similar here. 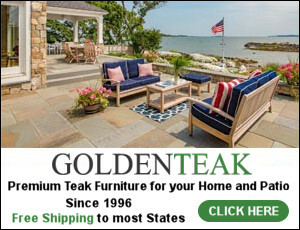 Curtain Rod – Q Design – brass – similar here. Rug – vintage one of a kind – similar here. 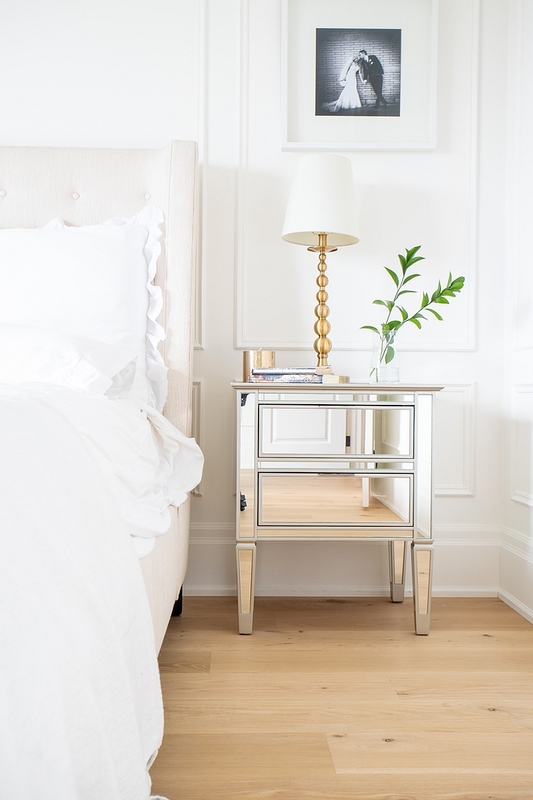 I wanted the master bedroom to be soothing and calming so I kept it all white. Natural woods and whites are my favourite combination. This is a great space to retreat to after a long day. 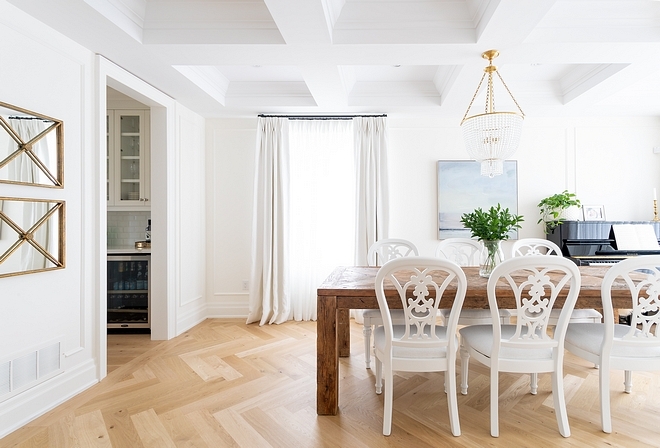 We painted the millwork the same colour as the walls Benjamin Moore’s Simply White. Pom Pom/Tassel Blanket – Berber Themes Moroccan Pom Pom Blanket Cotton – similar here & here. 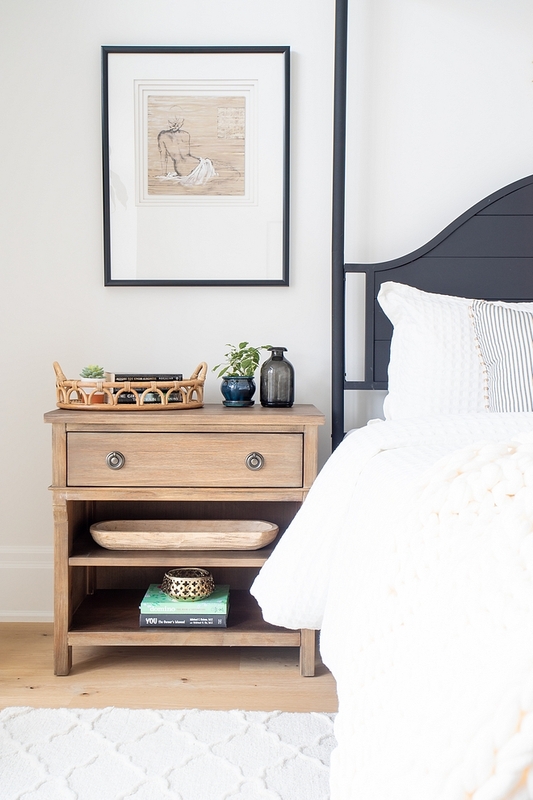 Bed – Elte (no longer available) – similar here, here & here (tall headboard). Lamps – Ralph Lauren from HomeSense. 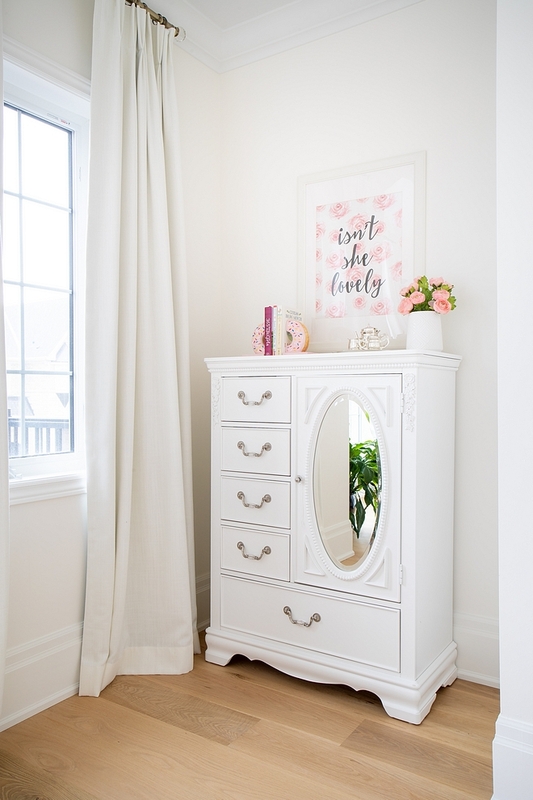 Dresser – Ikea Hemnes Dresser – similar here, here & here. 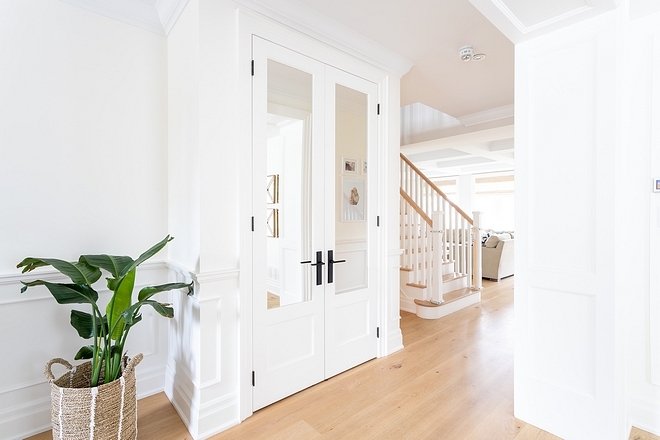 All of the wainscoting and millwork is painted Benjamin Moore Simply White (same as the wall colour). 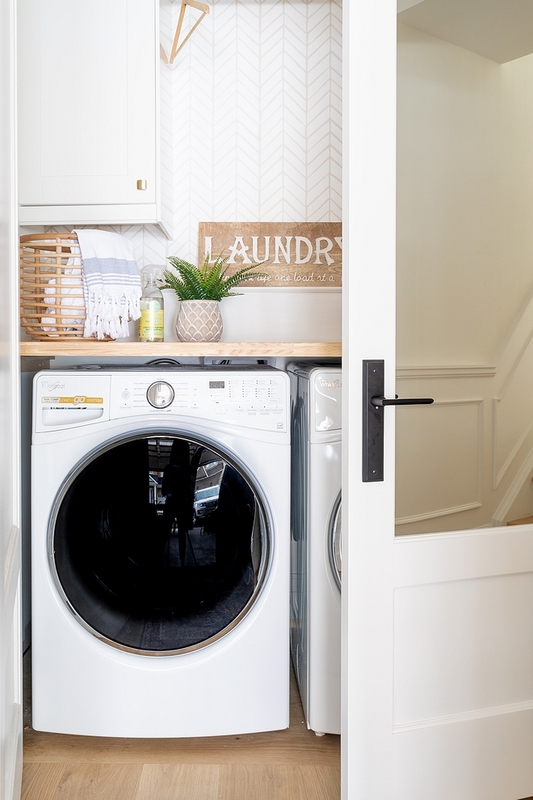 Our laundry room was downsized to a laundry closet. 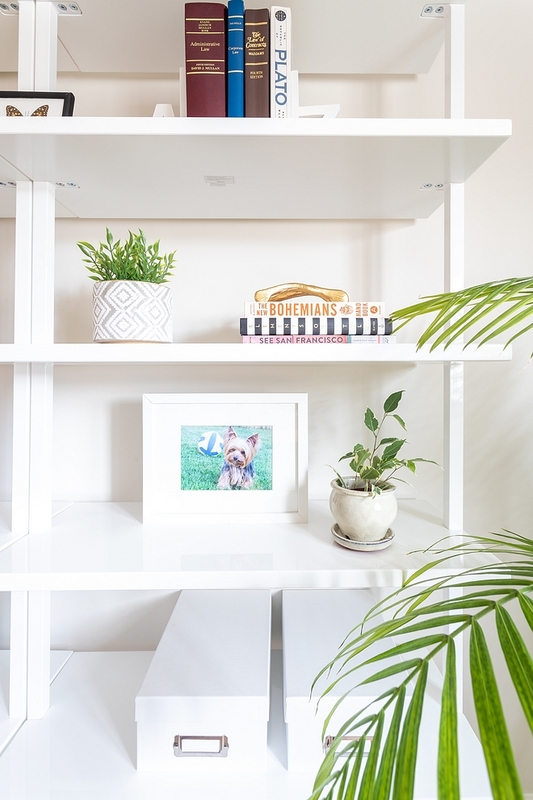 It’s small but it’s a functional and cute space. Wallpaper – Serena & Lily in Bone. We decided to keep our basement as a kid zone for the next few years. You’ll find lots of toys down here. This playhouse under the stairs is always a favourite for all visitors both big and small. It comes fully equipped with a play kitchen and a reading nook. 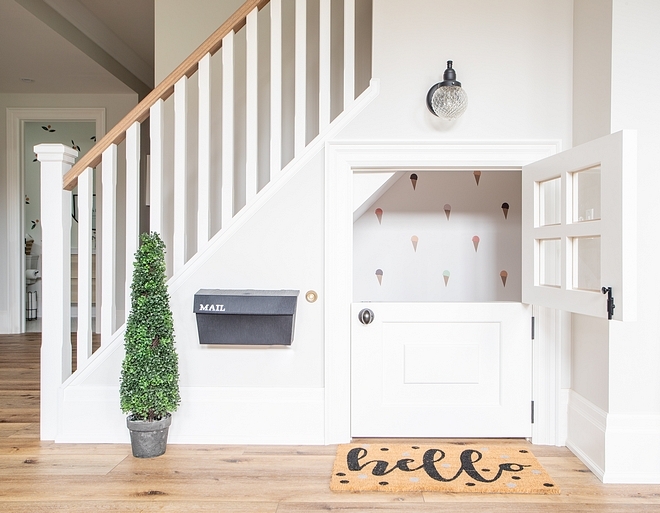 The dutch door is kid favourite too! 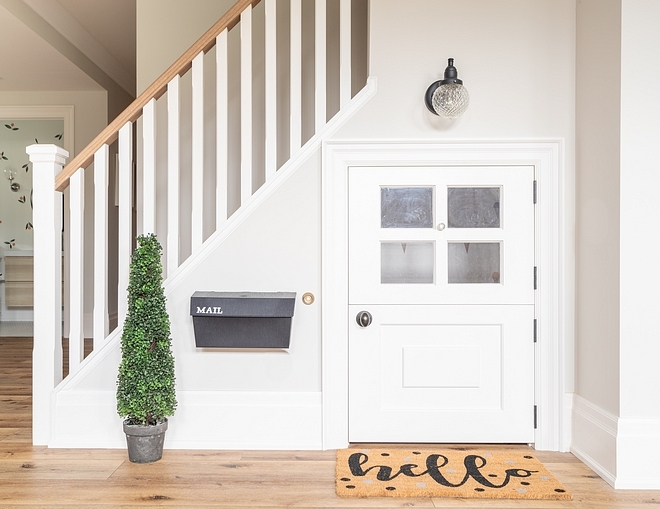 Doormat: Homesense – similar here. Basement Paint Color: Benjamin Moore OC-23 Classic Gray. Basement Flooring: Purparket Vinyl 9 inch floor Latitude High Performance Vinyl in colour Flint. 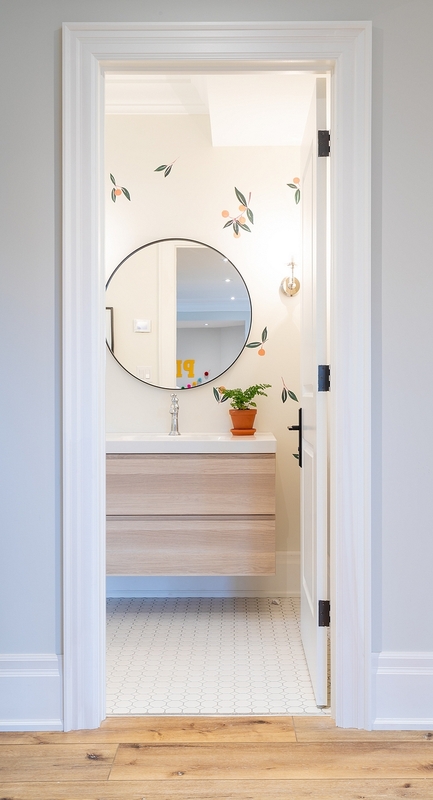 This bathroom feels cheerful and it’s perfect for guests. 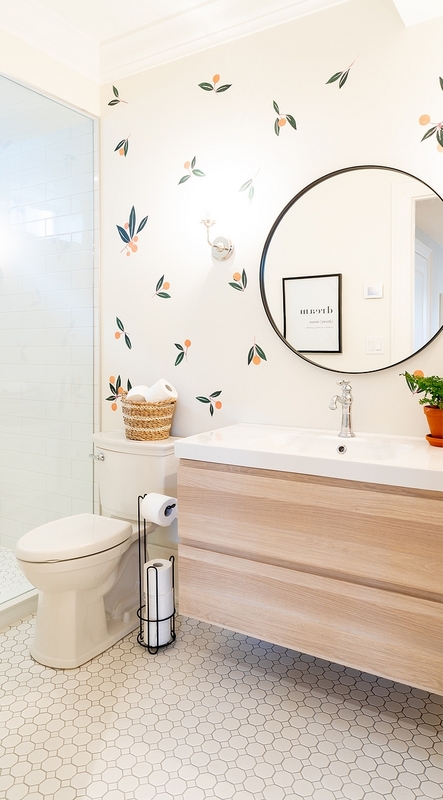 The floating vanity is from Ikea. 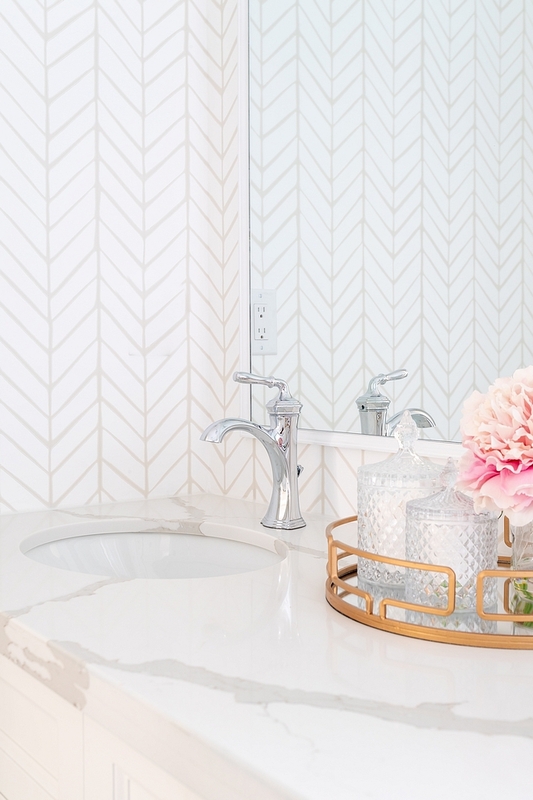 For the basement bathroom I opted for some cute decals from Urban walls. Wall paint color is Benjamin Moore Swiss Coffee. Faucet – Delta Victoria Single Handle Faucet. Mirror: Ikea – similar here. Floor Tile: White Porcelain Mosaic Tile – matte white. Many thanks to Agata for sharing all of the details above. Make sure to follow @TassonInteriors on Instagram for more inspiration! 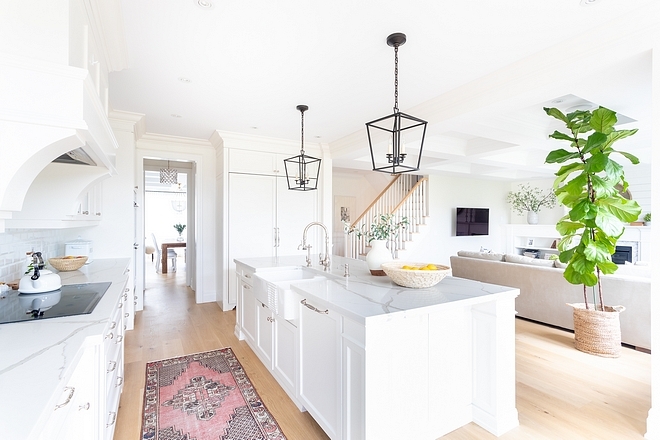 Gorgeous photography by Cameron St.
What is the ceiling height in this house, specifically the kitchen? Thanks!